While prevention is always the goal when it comes to a hospital-acquired infection, rapid diagnosis is essential to better outcomes. The sooner the physician knows which pathogen is causing the infection, the sooner she can prescribe the correct antibiotic. The sooner the medical team can determine if a patient is cleared of infection, the sooner that patient can be removed from isolation. Unfortunately, traditional diagnosing requires samples from the patient be plated and cultured, a process that can take from 16 hours to several weeks. However, a technology exists that allows pathogens to be identified in just a few hours. 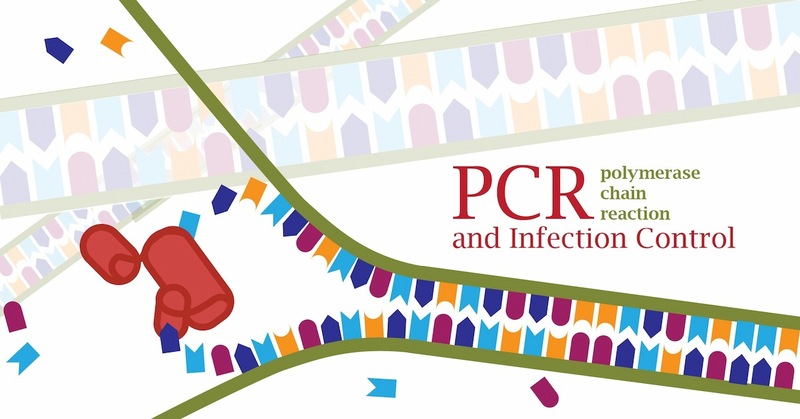 Over the course of two posts, we will explore the transformative technology of polymerase chain reaction, or PCR, and the impact it is having on hospital infection control. PCR is a process that begins with one DNA fragment and ends with millions of copies of that DNA fragment. Why are copies so helpful? PCR amplifies a DNA sample into a quantity that is easier to measure, identify, and analyze. We will start with an overview of the way nature accomplishes DNA copying. In all living things, part of the life cycle of cells is dividing, thereby creating more cells (brain cells, skin cells, leaf cells, everything). During mitosis, the DNA double helix splits down the center, like unzipping a zipper. This leaves two sides of a zipper with nothing to zip onto. An enzyme called polymerase then connects free-floating nucleotides (zipper teeth) onto each half, creating two complete zippers. In this way, every living cell on Earth is able to copy entire strands of DNA, an entire genome, over and over again. You can consider PCR as a way of taking advantage of nature's own way of duplicating DNA and amplifying it under controlled conditions. In a laboratory setting, we use this same chemical process to make millions of copies of just the portion of DNA we are interested in. The key is putting all the building blocks into the correct conditions and let them do their thing. First, the DNA we want to copy is placed into a vial along with polymerase, short DNA primers (pre-joined zipper teeth groups), and nucleotides. The types of primers vary depending on your goal. If you are trying to confirm a pathogen, you place your sample and the primers for the pathogen you believe it is (primers for C. difficile, for example). To identify a pathogen, you would use a broad spectrum of primers (many pathogens) and then see which one was copied. Heating the mixture to a high temperature denatures, or unzips, the double helix of DNA molecules. Cooling the mixture allows the primers to connect to the now-divided original DNA, a process called annealing. These primers serve as a starting point for the copying. The heat goes back up - not quite as high as before - which prompts the polymerase to do its job: Scooping up the free nucleotides and filling in the missing slots. The result of this extension is two complete DNA strands. Fun fact: The polymerase used in PCR is from a thermophillic (heat-loving) strain of bacteria, Thermus aquaticus, which thrive around hot springs and can therefore tolerate the high temperatures of the PCR process! The PCR process is then repeated 25-35 times, with the DNA copies growing exponentially until there are millions of the target DNA strand. From beginning to end, the process takes under 4 hours. This rapid duplication of DNA helps a variety of fields, from crime scene forensics to paternity tests. However, in the hospital, it allows for rapid diagnostics that could mean the difference between life or death. We'll discuss this application of PCR in our next post.